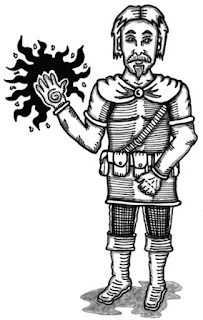 What do you think this guy is casting (or maybe it isn't a spell)? Any ideas gratefully received (and names for him too). I shall incorporate the ideas and the name I like best into the next game I run and he shall be an NPC to live into fantasy-history! Maybe he is waving goodbye as a rift in the universe is about to engulf him from behind. Or maybe he is Etran, Thule-master. He is casting an entrapment spell that will encase a poor soul in an impenetrable box of darkness. As light is both a particle and a wave, Thule is both the particle and wave that appears in the of absence of light. This will not be a good day for someone.